Julián David Morillo Pozo obtained his Engineering Degree in Computer Science from the UPC (Universitat Politècnica de Catalunya, Technical University of Catalonia) in 2002. 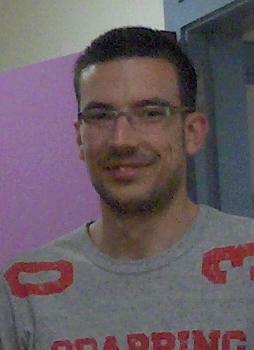 He obtained his PhD from UPC in July 2009 (his PhD advisor was Jorge García Vidal). He joined the Department of Computer Architecture of UPC in September 2003, as a researcher supported by EU funded research project WIDENS. Since 2005 he is adjunt professor. He was a visiting intern in the Internet Group of Telefonica Research in 2008. Currently he works in the Computer Networking Research Group led by Jorge García Vidal, where he participates in the project EuroNF from the 7th Framework Program and in the Spanish project TSI2007-66869-C02-01. His research interests are Vehicular Ad Hoc Networks (VANET), Delay Tolerant Networks (DTN), Cooperative Networks and Wireless Multimedia Sensor Networks. He lectures on Computer Networks in the Computer Science School (FIB) of UPC. J. Morillo-Pozo, D. Fusté-Vilella, J. García-Vidal. Published in the book “Cooperative Wireless Communications”, Auerbach Publications, CRC Press, Taylor and Francis Group, 2009. ISBN: 978-1-42006469-8. O. Trullos-Cruces, J. Morillo-Pozo, J. M. Barcelo-Ordinas, J. Garcia-Vidal. ICC '09 IEEE International Conference on Communications, Dresden, Germany. D. Giustiniano, E. G. Llairo, J. Morillo, A. L. Toledo, P. Rodriguez. 2009 IEEE Workshop on multiMedia Applications over Wireless Networks (MediaWiN 2009), pp 25-29, 5-8 July 2009, Sousse, Tunisia. D. Fuste-Vilella, J. Garcia-Vidal, J. D. Morillo-Pozo. 1st IFIP Wireless Days, 2008. WD '08. United Arab Emirates, 24-27 Nov. 2008. ISBN: 978-1-4244-2828-1. Frame Error Rate Evaluation of a C-ARQ Protocol with Maximum-Likelihood Frame CombiningJulián David Morillo Pozo, Jorge García Vidal. in proceedings of WINSYS 2008, International Conference on Wireless Information Networks and Systems, Porto, Portugal, July 26-29, 2008. ISBN: 978-989-8111-62-3. IADIS International Conference. Wireless Applications and Computing, 2008.
in conjunction with ICDCS 2008, Beijing, China, June 20, 2008. Lecture Notes in Computer Science (LNCS), Volume 4396, pp 43-61, 2008. ISBN: 978-3-540-89182-6. Fourth EuroFGI Workshop on Wireless and Mobility 2008, Barcelona, Spain, January 16, 2008. 18th Annual IEEE International Symposium on Personal, Indoor and Mobile Radio Communications, IEEE PIMRC 2007. Athens, Greece. ISBN: 1424411440. Jorge García-Vidal, Manel Guerrero-Zapata, Julián Morillo-Pozo, David Fusté-Vilella. Lecture Notes in Computer Science (LNCS), Volume 4396, pp. 62-72, 2007. ISBN: 978-3-540-70968-8. J. Morillo-Pozo, J. García-Vidal, A. Pérez-Neira. Third EuroNGI Workshop on Wireless and Mobility, Sitges, Spain, June 2006. J. Morillo, J. García, A. Pérez-Neira. in proceedings of the 2005 Joint Workshop on Foundations of Mobile Computing. Co-located with ACM/SIGMOBILE MobiCom 2005. September 2, 2005. Cologne, Germany. ISBN: 1-59593-092-2. Ll. Cerdà, R. Guimaraes, J. Morillo, J. M. Barceló, J. García, A. Pérez-Neira, M. Realp, M. Voorhaen, C. Blondia, R. Knopp, N. Nikaein. 2nd Workshop on Trends in Radio Resource Management, Barcelona, Spain, 2005. R. Guimaraes, J. Morillo, Ll. Cerdà, J. M. Barceló, J. García. XV Jornadas Telecom I+D, 2005.